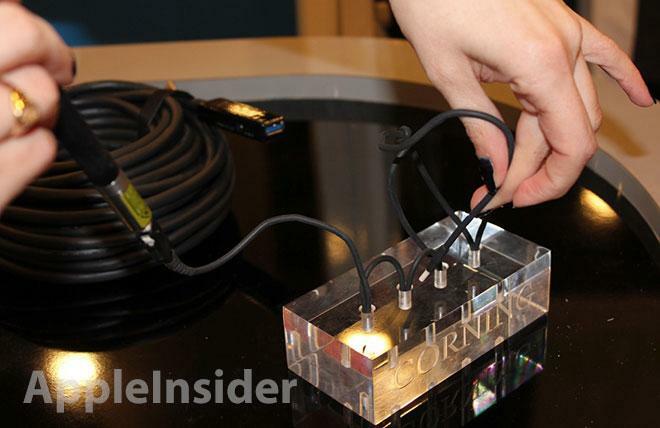 Corning's "Thunderbolt Optical Cable" (left) and USB "3.Optical Cable" (right). 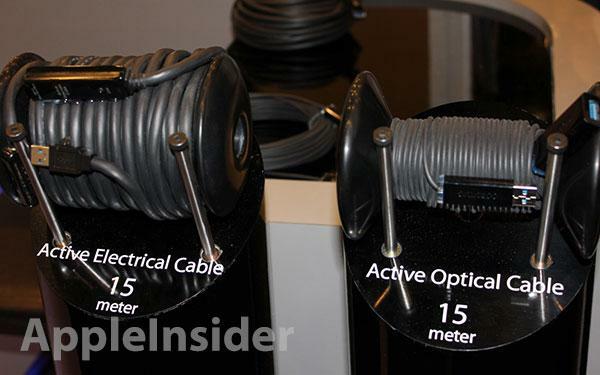 Corning had two types of optical cable on display: one compatible with the Thunderbolt standard; and another compatible with USB 3.0. Cable lengths for each range from a few meters to a hundred. The connectors house a small converter at each terminal that turns an electrical signal from a Thunderbolt or USB port into an optical one and sends that signal along the fiber before it is reconverted on the other end. 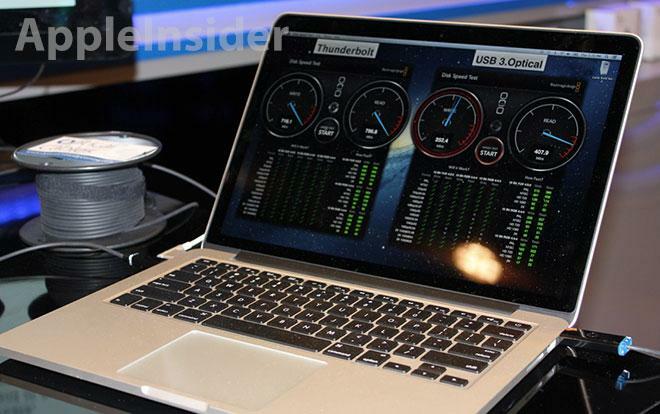 To demonstrate their tech's effectiveness, Corning was running data speed tests —reading and writing to hard disks and SSDs —with the signal bouncing from a MacBook Pro with Retina display to the disks over 30 to 100 meters of fiber. The read and write times they were getting from the hard disks, according to the attendant, were at that point capped only by the disk's read-write limitations. "I've got a friend who does video editing and loves to work in absolute silence," said my booth guide. "She can't stand the whir you get from a hard drive spinning. Drives her crazy. This means she can put all of her drives in another room  not just a closet  and run fiber to wherever her workstation is." The USB 3.Optical Cables max out at 30 meters, while the Thunderbolt Optical Cables can reach lengths up to 100 meters without daisy chaining. I looked along the length of cable. On the MacBook screen, the speed test continued apace, with the Thunderbolt cable reading and writing in excess of 700 megabytes per second. "Now, I know what you're thinking," she said, "where's the real benefit?" I had actually been thinking about lunch. She stepped away and returned with two coils of cable: one massive, the other lithe by comparison. She plopped the massive one into my hand. "Now this is fifteen meters of your standard copper wire. Big, heavy, needs a repeater every so often or the signal degrades." It was indeed big. And heavy. She set the lighter coil in my free hand. "And here's your Corning fiber cable. Same length. Fraction of the weight. Fraction of the size," she said. A convincing comparison. She took the coils from me. "And right now, you're probably thinking: but this is just glass, what if it breaks?" Having skipped breakfast this morning, I had, in fact, been thinking about lunch again. I kept silent, watching her as she produced the torture test: an iron maiden for fiber optic cables, except made of plastic, and with less spikes. Attached to one end of a fiber cable was a laser pointer. The other end was free, but the length between was knotted, bent 180 degress, looped, and pinched at multiple points. "We've given these things to our partners, had them loop them through hallways and run over them, walk over them, everything," she said. "No breakage, no signal degradation. Still functioning." And, true enough, the red laser light shined through the other end of the cable, undeterred by the bends and knots. Corning will likely be rolling their fiber cables out some time in the second quarter. My attendant couldn't offer a specific timeframe, and gave no information on pricing.